Maddie Harmon, who won 1st place while Kiley Feese and Ty Cheatham received 2nd and 3rd place. Adair County High School FFA Member Ashley Hadley (pictured below) was the winner and highest scoring individual at both UK and WKU FFA field day Career Development Events in Floriculture. 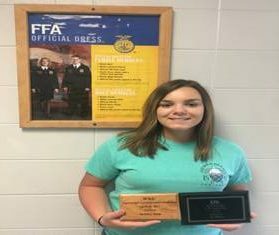 Ashley became the first student to win both contests from Adair County.